Vacant, recently surveyed 0.50 acre high and dry mostly cleared commercial lot with 155.01 ft of US Hwy 76 frontage and a shared gravel access drive with direct median cut access. 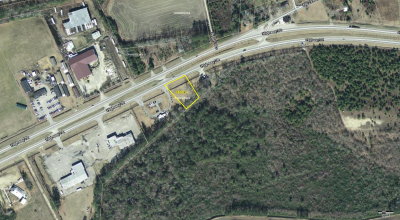 Property is located between 3431 E. Hwy 76 (Olsten) and 3417 E. Hwy 76 (Freedom Auto Sales) approximately 2.45 miles W of the traffic light intersection of McIntyre Street Hwy 76 and Hwy 41 Main Street in Mullins. Shared existing access drive to be recorded on survey. This property is in very close proximity to the intersection of US Hwy 76 and the proposed I-73 corridor, offering a future investment opportunity. All utilities appear readily available to this excellent commercial site (confirmation of availability and tap fees with GSWSA is buyer responsibility). This lot appears construction ready with limited site prep.....and its priced to sell!